held in rural,pristine Perrysville Ohio. We are so grateful that some of you who attended our first camp back in 1996 and are still with us today! 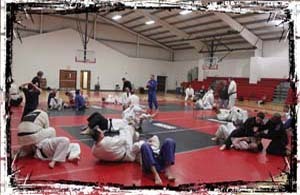 Our purpose then was to keep you on the cutting - edge of new techniques, drills,and training methods to help you stay ahead of the game. Our purpose is the same today. As always we will be hosting some of the best coaches and instructors on the planet. Shingitai has always been at the forefront of innovation,and we are proud to usher in this exciting ground breaking event. at the SJA Spring Training Camp. Most important,though,you will take home tons of new techniques and training information --- and you will have a blast doing it!